Defending Principles focusing on pressing as a unit. Technical aspects to include pressure, cover and balance. This fast-paced exercise acts as a warm up to develop players to recognize pressing cues and triggers. 8-12 players, 1 ball, 10x10 or 12x12 area, 4 cones. 1st player starts with the ball and is pressed by player on opposite cone. 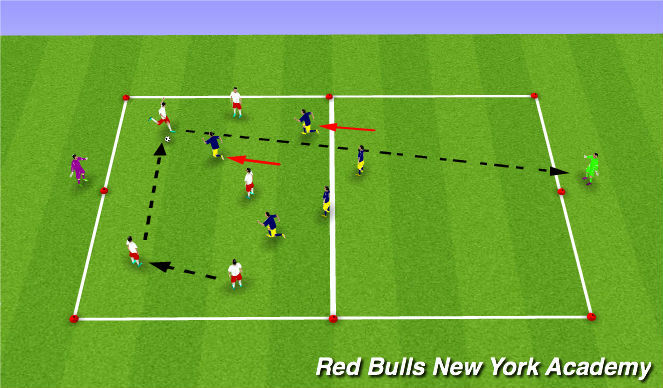 Player with the ball passes to player to his right and moves to the left. Repeat so that the ball is moving to the right, passer moves to the left and each player receiving is pressed. Press the ball quickly - When the ball is played into the player make sure the defender is sprinting out to close the space. It is important that the defender slows down when approaching the player with the ball. Read the triggers & cues - Players should always be ready and aware of when the opposition player is receiving the ball so they can press. Triggers will be when the player who is passing the ball opens their body to make the pass, and when the player who is passing the ball puts their head down to make the pass. Move as the ball travels - As the ball is played into the opposition player, it is important that the defender movers as the ball travels and is already pressing. Do not wait until the opposition have secured possession before pressing. 6v3 ‘Defending Rondo’ aims to develop players to prevent or restrict the penetrative pass while recognizing cues to press and regain the ball. 6 Attacking players positioned on designated 10 yard lines of the area and 3 Defending players inside the area. Only 2 defenders are allowed in a 10x10 grid at any one time and the Defenders can rotate who goes in. The Attacking players aim to combine and play penetrative passes between the Defenders (third passing line) across the area without the Defenders intercepting the ball. Attackers are not permitted to go inside the area and must stay on the lines of the area or within a step either way. The Defenders aim to prevent the penetrative third line pass and look for opportunities to press and regain possession of the ball. However, the Defenders should also look to prevent first line (in front) and second line (around) passes, as these passes change the angle of attack and can create opportunities for the penetrative pass. Once the Defenders have regained the ball or forced a misplaced pass on 3 occasions, change the Defenders. Provide cover and balance - Players should recognize which defender presses and which defenders provide balance and cover behind the pressing player by communicating between each other. Compact - to Remain compact, players need to demonstrate appropriate angles and distances. To achieve this they must take up cues off the pressing defender and take up a position to offer support and prevent the penetrative pass. Triggers - Defenders need to anticipation the weight, speed and direction while also recognizing cues to press and challenge for the ball (Poor/weak pass, Bad 1st touch by receiver, Set traps for a predictable pass) intercept passes. 20x20 y square. 12 players, 2v2 in middle, 1 ball. 2 teams of 6. Teams line up vertically and horizontally. 2v2 in the middle. Two players in the middle are trying to work the ball from one outside line to the other. 1 point for everytime the ball is tranferred. Outside players are limited to two touches (if needed) and the ball must always be moving. Each game can last 2 to 3 minutes as this is a high intensity session. Players rotate. Make sure pressure and cover is on and appropriate. Pressure needs to be high. If the defense chooses medium or low, they will be exposed. If the defensive teams concedes a point, they must quickly reorganize so the attacking team does not score successive points. Players who struggle with this will resort to ball watching when they should be pressure to prevent the forward pass. There are two moments in this activity that will generally produce important coaching points - the moment the defending team wins possession and when a point is scored and the team in possession is attempting to score again. Attackers aim to combine and play the ball directly into the target players hands to score 1 point, or 2 points if the ball is played directly from the team&apos;s defensive half. The team in possession must perform 4 passes before they can hit the target player. The Defenders aim to prevent the penetrative pass to the target player and look for opportunities to press and regain possession of the ball as quickly and as high up the pitch as possible. Once the Defenders have regained the ball, they become the attacking team. If the ball reaches the target player, the target player resets the game by playing to the Defending team in their defending half. Rotate roles of target players or utilize GKs. Compact - To remain compact, players need to demonstrate appropriate angles and distances. To achieve this they must take up cues off the pressing defender and take up a position to offer support and prevent the penetrative pass to the target player. Goal and Goalkeeper at each end. Area divided into a middle third (18x44) and 2 defensive/attacking thirds (24x44). 3 teams of 6 players with a team in each third. (numbers and grid can be manipulated based on players available). Red team start with the ball in their designated third and must play back to the Goalkeeper before they can then attempt to penetrate the middle third and pass to the Yellow team in the opposite third. The Blue team can send 3 Defenders into the end third in an attempt to press and regain the ball, in a 6+GKv3. If the Defenders (Blue) regain the ball the remaining 3 players can enter the third, creating a 6+GKv6 as the Blues attempt to score. The Red team then move to the middle third and become Defenders. If the Red team successfully penetrate the Blue team and the ball reaches the Yellow team, the Blue team score 1 point and the Yellow team must play back to the Goalkeeper as the other 3 x Defenders (Blue) attempt to press and regain possession. The remaining 3 Defenders in the middle third should be encouraged to shift and slide with the press, creating a defensive screen as they would in a game.